When you decide to embark on a career in the animal science field you’ll find that the profession is filled with people just like you who share a love of animal welfare. There are few professions that afford workers the same amount of satisfaction and personal development, teamed with a working environment that is always active and interesting. This course is designed for students to meet entry-level employment requirements as an animal care technician and other related occupations. The course offers training in large and small animal care and includes classroom/laboratory instruction and placement in an internship. Content includes: comparative anatomy and physiology, basic pet grooming skills, animal restraint, nutrition and housing, medical terminology, species and breed identification, disease control-management and human/animal issues. Qualified students may have the opportunity to work towards their veterinary assistant certification which includes taking a certification exam. This is an actual college course. Veterinary Technology students should have above average skills in reading and writing and science; a 2.5 or higher grade point average is recommended. Students should also have a solid attendance record and are accountable to both the KHSD and their assigned work site’s dress code. Students earn 15 units per semester. 10 units Life Science and 5 units elective credit first semester and 15 units elective credit second semester toward their high school graduation. ROC’s Veterinary Technology course is the same as Bakersfield College’s ANSC B83 Introduction to Veterinary Technology. Students are concurrently enrolled in Bakersfield College, with their ROC grade posted to both their official KHSD and BC transcripts. 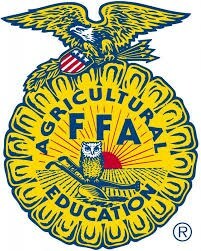 Veterinary Tech students have to opportunity to participate in ROC's FFA chapter.